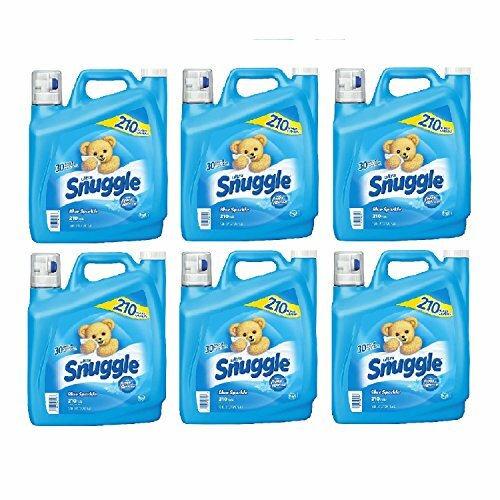 Snuggle Blue Sparkle Fabric Softener (210 Loads, 168 oz.) (6-Pack) by Europe Standard at Blog Free Here. Hurry! Limited time offer. Offer valid only while supplies last. Leaving clothes super soft and extra fresh for 30 days, Snuggle Blue Sparkle Fabric softener is safe to use in all types of washing machines. Leaving clothes super soft and extra fresh for 30 days, Snuggle Blue Sparkle Fabric softener is safe to use in all types of washing machines. Snuggle® Blue Sparkle fabric softener gets towels fluffy, blankets cuddly and helps clothes stay fresh for 30 days. Snuggle gives you the Snuggly Softness® that feels so good and the long-lasting freshness your family loves. Each container lasts for 210 loads when used as directed. The included convenient no-mess dispenser and dosing cup allows you to measure for all load sizes. Snuggle liquid fabric softener is HE compatible, meaning it is safe to use in all types of washing machines. Features no-mess dispenser. For use in all washing machines.